I would like some input from experienced star testers. 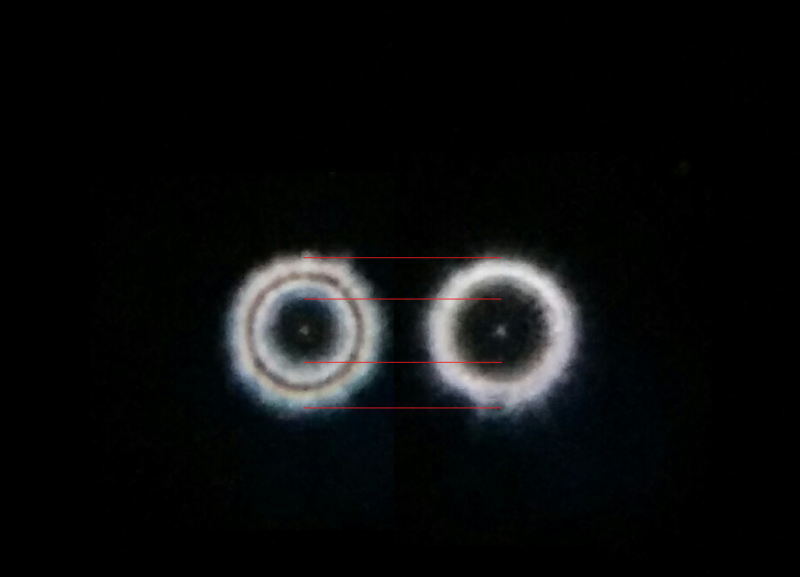 The image on the right is 4mm extra focal, and the left is 4mm intra focal. Both images are to the same scale. Instrument is f/10. CO is approx 40%. I added the red lines to aid in measurement. How much over-correction is present? What other glaring aberrations do you see? Edited by Boom, 19 March 2019 - 12:16 PM. You should be 10~ defocused. how well acclimated was the system? what eyepiece, did you use a Barlow? What camera was used? your images look a little different, probably cus your still in the caustic. Edited by Pinbout, 18 March 2019 - 08:48 PM. I referenced Suiter's chart which says 10 waves is about 4mm in and out for a f/10 instrument. EP was a 6.5mm PL, no barlow, cellphone EP afocal. I noticed the outer diameter of the rings of my images are practically identical. Isn't one image supposed to be larger than the other, and CO shadow smaller than the other, if SA is present? Makes me think this instrument actually doesn't have that much SA, but there is a zone error causing the CO shadow to be different. Defocus distances look very good for detection correction errors. The shadow of the of the extra focal image IS considerably larger than the infra focal image. do the same with obstruction mask, if that was used. Isn't one image supposed to be larger than the other, and CO shadow smaller than the other, if SA is present? cause some off the visual on intrafocal looks more like under but the co sizes show over. but either the atmosphere or acclimation is causing too much turbulence. and if you want to see zones you have to defocus a lot more. Edited by Pinbout, 19 March 2019 - 06:16 AM. At f/10 +-10 waves of defocus would be +-4.4mm. The near equiv size of the images suggest a mixture of low order (LSA) and high order (HSA) spherical error. In this case approx overcorrected 1/5 wave LSA and undercorrected -1/5 to -1/10 wave HSA. Evaluating mixed optical errors from a web graphic is mostly a guess, as being off by 50% quite possible. But I think the signs are correct anyway. When a scope has a mixture of theses errors its difficult to evaluate visually. IIRC Suiter recommends defocus of +-15 waves for this particular mixture, but I remain fairly skeptical it can be done well. When you have a mixture of aberrations I recommend using the WinRoddier program or the WavefrontEstimator (Mike Schuster's script) included in PixInsight. This requires a linear detector and more defocus on the order of 20 waves. A cell phone has on board level adjustments as well as sharpening which makes any analysis problematic. No mask was used. I'll try some out. It was acclimated. Probably a combination of turbulence and slightly rough optics? I'll give more defocus a try. You're right a cellphone isn't the best for recording an accurate image, but I'm limited in what I have to work with. It is an SCT, but I intended this to be an exercise in star testing, not so much a telescope critique. Edited by Boom, 19 March 2019 - 12:19 PM.